In March 2003, with the support of the Ministry of Science, Technology and Tertiary Education and the Ministry of Education, NIHERST embarked on a novel outreach programme entitled "Community Science Weeks: Being at Home with Science". This programme has been structured to make science and technology learning more accessible to rural communities and communities that are under-served by the National Science Centre. Since 2003, this outreach programme has been taken to fifteen (15) communities in Trinidad and Tobago, most recently Caroni East, Manzanilla and Toco in 2013 and Fyzabad and Gasparillo in 2014. 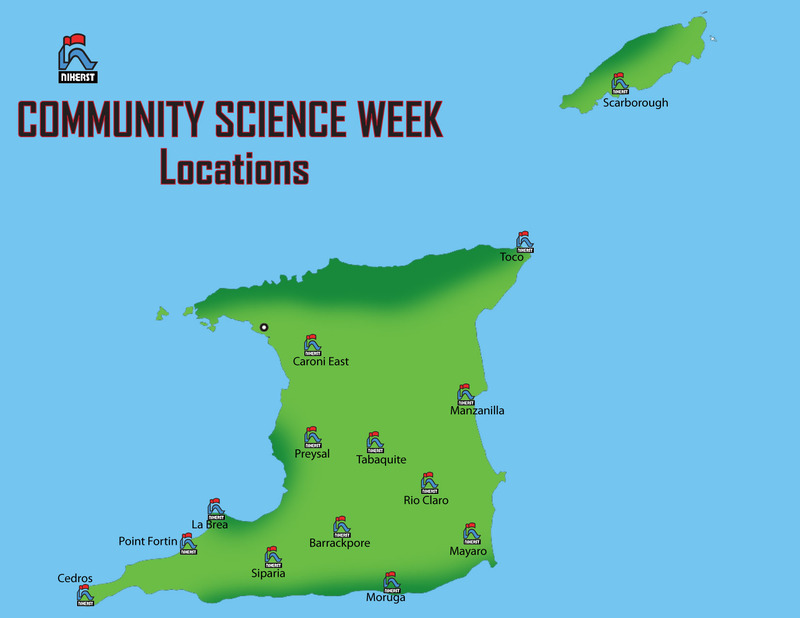 The general content of the Community Science Weeks includes a mixture of interactive exhibits, workshops, lectures and entertainment designed to engage residents in a fun learning atmosphere. Playful hands-on exhibits from the YAPOLLO exhibition, other exhibits at the NIHERST/NGC National Science Centre, and Creative Design Laboratory illustrate a variety of basic and applied scientific principles, including robotics. For primary students, there are workshops on Primary Science curriculum topics with particular focus on the difficult areas for students and topics at the Standard Two and Standard Four levels, which are tested nationally. For secondary students, topics in the 'hard sciences' and electronics at the Fifth Form level are covered, as well as robotics which is on the Computer Science syllabus. One-day workshops are also conducted on problematic areas of the CXC Chemistry, Physics and Biology exams, based on the CSEC examiners' reports. The week's programme also features presentations by companies, governmental agencies, professional societies and NGOs (preferably from the community), who are always eager to partner with NIHERST in showcasing the science and technology behind their operations. They mount of displays and lead a discussion / seminar on a theme relevant to the community in which the Science Week is being held. Community Science Weeks also have a cultural component wherein school children in the community display their creative talents and showmanship in an entertainment programme. Opportunities are also grasped by NIHERST to learn more about 'the science behind' some unique attribute of the community, which is captured on film in the Institute's "Science For All" documentary series. The series is aired on national television. The NIHERST Community Science Week programme aims to be exciting, relevant and responsive to the needs of communities. Each science week is therefore tailor-made and adapted for the targeted community - the content of one is never completely the same for another. This is achieved in part, by the participatory approach adopted by NIHERST in planning the event, which ensures that each Science Week is developed in collaboration with community stakeholders: Educators, Community Based Organisations (CBOs), and community elders. At NIHERST, we believe that by bringing families, children, and adults together to learn about their world, we can encourage participants to become life long learners of science. Help teachers and students to better grasp scientific concepts, processes and issues that affect their daily lives through stimulating experimentation, demonstrations, workshops and exhibits. To find out more about our Community Science Week series call the NIHERST/NGC National Science Centre.